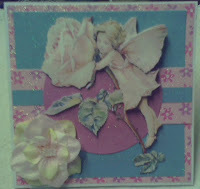 Here are 2 pictures of a card I made for a friend. The pictures are not very good, my camera takes lovely pictures when things are about 10-15 feet away but try to get close not so good. I have tried the macro but it always seems grainy. I am putting a new camera on my birthday list but will have to wait until November unless I'm lucky and get one for our anniversary/valentines day in February. 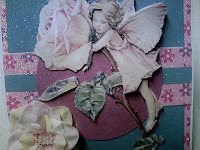 I will be entering the It's a Crafter's Companion challenge the theme is orange and yellow. You have to have your entry in by Sunday so as usual it will be a last minute rush on Saturday night.